Building on high quality early childhood classroom environments, these are the additional starter materials classrooms will need to fully launch the Tools of the Mind PreK curriculum. Teachers will learn about the activities and how to implement them in their Tools of the Mind professional development workshops. There are also separate consumable items, which programs will need to purchase each year, or as needed, to replenish as supplies are exhausted, listed under the PreK Consumable Materials tab. Children use individual whiteboards in several Tools activities in PreK & K. This set comes with dry erase markers and erasers! 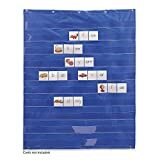 Teachers like to use these to store Play Planning materials in PreK; Individual Scaffolded Writing materials in K. In PreK, teachers like to have one for each teacher or Play Planning group; in K, there is one for each team.